In an industry where the egos behind the camera can be as big as those in front of it, the Academy of Motion Picture Arts and Sciences is settling a dispute over who deserves "producer" credit for films. The academy said it will announce its decision Thursday on who will be awarded Oscars if one of three nominated films — the Howard Hughes biopic "The Aviator," the boxing saga "Million Dollar Baby" and the Ray Charles portrait "Ray" — should win. The academy stepped in after the studios behind the films failed to pare the long list of producers credited on each film down to the maximum three allowed under academy rules. Why limit the number of producers who can take credit for an award-winning film? And what do producers do, anyway? Those questions came to a head in 1999, when five producers, including Miramax studio chief Harvey Weinstein, took the stage to accept the best-picture Oscar for "Shakespeare in Love." The spectacle rankled those angered by "credit creep," the tendency of filmmakers to massage the egos of actors, directors, studio executives — even talent managers and agents — by giving them on-screen credit for jobs they did not perform. "The title of producer has in the last 20 years become a bargaining chip, a negotiated perk, given to those who can extract it from the studios," Kathleen Kennedy, president of the Producers Guild of America, said last year when introducing a new program designed to limit credits. After the "Shakespeare in Love" flap, the academy adopted its rule limiting each nominated film to three producers. In October, the guild began a "Truth in Credits" campaign, which included advertisements featuring such prominent producers as Jerry Bruckheimer and "Star Wars" creator George Lucas. "Even in science fiction, the fiction should end when the credits roll," the Lucas ad read. According to guild guidelines, a producer exercises decision-making authority in one or more of four areas of filmmaking — development, pre-production, production and post-production/marketing. Most moviegoers have no clue who produced a movie. 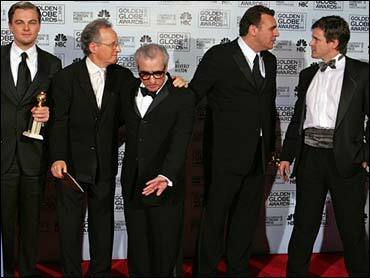 Directors, such as Martin Scorsese or Clint Eastwood, and the stars themselves carry more clout with audiences. Vance Van Petten, the guild's executive director, says audiences snicker when they see a dozen or more names of "producers" scroll by at the end of a film. And he says moviegoers should care when hundreds of thousands of dollars are spent to pay people who do not directly contribute to the making of a film — money that could have been spent improving the movie's quality. Those arguments fail to persuade Chuck Binder, a talent manager who's credited as a producer on several movies starring ex-client Sharon Stone. "If you have talent that the buyer wants, they are going to give you a producer credit, they are going to do whatever it takes to lock somebody up," Binder said. "People knew that if you wanted Sharon Stone you were getting Chuck Binder as a producer." Producer fees can run in the hundreds of thousands of dollars. The norm for managers and agents is to demand 10 percent of their actor's fee, Binder said. Binder dismisses claims that long lists of producer credits hurt audiences or constitute false advertising. "That's a bit of a reach," he said. "What about people who sit in the seats and watch Ford commercials? Seeing one more name flash up on the screen for 20 seconds isn't really going to harm the viewer." Since the academy is expected to use the Producers Guild criteria on who should receive credit for producing "The Aviator," chances are good the list will not include Charles Evans Jr. In a suit against fellow producer Michael Mann in 2001, Evans said he was responsible for developing the idea and persuading Leonardo DiCaprio to portray Hughes. Eventually, Evans claimed, Mann cut him out of the deal altogether, taking DiCaprio and the project to another studio. The lawsuit was settled, and Evans was listed as a producer on the final film. Then Martin Scorsese was hired to direct. Mann and fellow producer Graham King were recognized when the movie won this year's Producers Guild award. But Evans was left out because, according to guild guidelines, he had no decision-making authority over the final film. The decision has already created one awkward moment, when Evans forced his way into a photo backstage at the Golden Globes ceremony. Binder, for one, thinks Evans deserves as much credit as anyone. "Even though Michael Mann and Marty Scorsese are much more powerful than Charlie Evans Jr.," Binder said, "it seems like he was the one who got the train rolling. He really should be considered their equal."